It’s worth noting that a Congressman from Oklahoma has lent his name and credibility to a Republican effort to cut nearly $40 billion from the nation’s food stamp program, an initiative that would leave millions of people vulnerable to sustained hunger and accompanying illness. 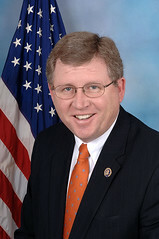 U.S. Rep. Frank Lucas, the Republican who chairs the House Agricultural Committee, sponsored the bill mandating the cuts to the Supplemental Nutrition Assistance Program (SNAP) as part of the overall farm bill. The measure narrowly passed the House Thursday on a 217-210 vote. The bill, which has little chance of passing the Senate or getting signed into law by President Barack Obama in its current form, is a political gesture designed to appease ultra-conservatives in the House. The Congressional Budget Office has estimated that the House legislation would deny benefits to 3.8 million Americans next year and save $39 billion over 10 years, or roughly 5 percent of the SNAP program’s cost in that time. Enrollment doubled to 47 million in the wake of the Great Recession as incomes plummeted and more Americans qualified for benefits, which average $133 per month. Most beneficiaries are children, elderly or disabled. The fact that the bill is a political stunt tells us something about the majority of voters here in Oklahoma. Lucas, who represents Oklahoma’s 3rd Congressional district, apparently can sponsor such a bill because he knows there will be no fallout from his constituency, and that tells us something about many Oklahomans. It tells us that behind the supposed legendary “great hospitality” of Oklahomans resides a stubborn cruel streak. Many Oklahomans, certainly the majority of state voters, are capable of simply ignoring the misfortune and suffering of their fellow citizens or they have allowed themselves to be blinded into oblivion with right-wing misinformation and ideology. More than 600,000 Oklahomans receive food assistance through the SNAP program. These are people in our communities and neighborhoods throughout the state. They have fallen, as most us could fall, into hard times, and the situation has been exacerbated by the recent economic downturn. Lucas, and those who vote him into office, and, in fact, our entire Congressional delegation, are turning their backs on these people. Denying people food, when food is abundantly available, is a craven act of immorality. There’s no other way to put it. The GOP false tropes on the issue are that people fraudulently obtain SNAP benefits and exchange them for cash and that people getting food assistance have no incentive to work. Both arguments are easily disputed through statistics, but that doesn’t stop the myths because they fit into a pre-conceived world view that pits neighbor against neighbor. Due to increased oversight and improvements to program management by USDA, the trafficking rate has fallen significantly over the last two decades, from about 4 cents on the dollar in 1993 to about 1 cent in 2006-08 (most recent data available). According to the organization Feeding America, “76% of SNAP households included a child, an elderly person, or a disabled person. These vulnerable households receive 83% of all SNAP benefits.” Note the number in that last sentence. More people have qualified for SNAP benefits in recent years because of the Great Recession, which began in 2007, and has been described as the worst economic downturn since the Great Depression in the 1930s. As the economy continues to improve, the numbers will decline. There’s no secret there; it isn’t some liberal plot. Conservative Republicans are simply exaggerating the situation to anger and motivate their base. This misguided anger and lack of compassion prevails among voters here in Oklahoma right now, and Lucas is the epitome of it. A story on NewsOK.com about the cuts claimed that Lucas “showed little enthusiasm” for the bill. So why did he sponsor it? What kind of person would deny food to millions of needy people, and what kind of people are those who would support him in this cruel, symbolic gesture?